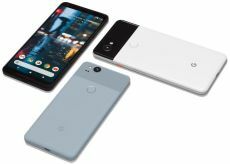 The Google Pixel 2 is more rectangular than its predecessor. The phone measures 145.7 x 69.7 x 7.8 mm and weighs 143 grams. The phone is pretty lightweight and will be very easy to hold and maneuver around. The back panel has a similar design as Google Pixel. The only difference being the glass 'shade' for the antenna to work has been moved up a little and the fingerprint sensor is not covered be it. The front panel has the display and the selfie camera along with proximity sensor and a speaker for calls. The right side panel houses the power and volume control buttons, while the left side panel is blank, just like the top edge. The bottom edge, however has the dual stereo loud-speaker grills and the USB-C port. 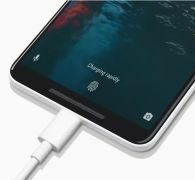 The absence of a 3.5 mm jack will be compensated by ability to connect headphones using the USB-C connector. The display of the Pixel 2 is a 127mm Cinematic style Full HD AMOLED Display with a screen resolution of 1080 x 1920 pixels. The display has a pixel density of 441ppi with an aspect ratio of 16:9. The screen is protected by a 2.5D Corning Gorilla Glass 5. With a superb contrast ratio of 100000:1, the Pixel 2 will be a phone with a display like no other. The display would produce Full 24-bits depth or 16.77 million colors. 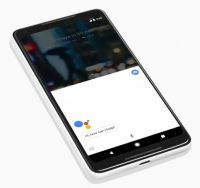 Google Pixel 2 "Personal Assistant"
The phone is powered by the world famous Qualcomm flagship chipset. i.e. the Snapdragon 835 Octa Core SoC (4 x 2.35Ghz + 4 x 1.9Ghz, A53 Cortex 64Bit Octa-Core). Performance is not an issue at all here as seen in HTC U11, Samsung Galaxy S8, OnePlus 5 etc. We can be rest assured that the phone's performance with heavy processing needs will be met with very easily. For graphic production and top-level gaming experience, the phone has the Adreno 540 GPU, that too is very well known to run very smoothly when playing graphics heavy games. Couple that with 4GB of RAM. Although there are phones that boast of 6GB and 8GB of RAM, for now 4GB is more than enough to get the work done beautifully without any hassles and lags. The phone will run on Android v8.0 Nougat and will be among the first phones to be installed with the latest Android OS out-of-the-box. The best part of it will be that it will be running the pure sstock Android v8.0 in it; which means that the phone will never have any issues with unnecessary softwares and all the native featuers will be accessible to the users - the phone will surely be a boon for developers. The Pixel 2 comes in 2 memory variants - 64GB storage and 128 GB storage. For video recording the phone's camera is capable of capturing 4K videos at 30fps, 1080p FHD @ 30fps, 60fps, 120fps and 720p @ 30fps, 60fps, 240fps. THe front camera is capable of taking 1080p videos @ 30fps, 720p@30fps and 480p@30fps. This is a litte strange as the front camera should be able to record better videos at better frame rates. As far as other mulitmedia options are concerned, the phone is capable of playback of all popular audio and video formats. Since there is no 3.5 mm jack, you'll have to connect your headphones using the USB-C to 3.5 mm dongle. Google is apparatly following Apple's footsteps in this section. The Pixel 2 comes with a paltry 2700 mAh Li-ion non-removable battery. This much battery backup is not enough to last through the day, given that the phone's users would like to keep it active all day. Though it is doubtful that the phone would last the day, with light usage, it should make it through. It is advisable that you carry the fast-charger that comes with the phone. The phone supports Qualcomm Quick Charge technology and would charge the phone to full capacity within minutes. The phone will support all 4G LTE/VoLTE networks, 3G HSPA/UMTS bands and all 2G EDGE/GPRS bands. The phone will support one eSIM/Nano SIM. The phone supports wifi 802.11 a/b/g/n/ ac dual-band (2.5GHz - 5GHz), Bluetooth 5.0 + LE, GPS w/A-GPS, GLONASS, BeiDou, Galileo for location, NFC for connectivity. For wired connectivity we have a USB-C port that will serve as the port for connecting OTG, other phones for transferring your data such as contacts, songs, files etc., and for connectng the headphones. The phone's array of sensors includes a Active Edge™, a Proximity / Ambient light sensor, Accelerometer / Gyrometer, Magnetometer, fingerprint sensor (rear-mounted), a barometer, a hall effect sensor, Android Sensor Hub and an advanced x-axis haptics for sharper/defined response. It can connect to 4G LTE conforming to VoLTE networks. It has the support of 3G HSPA/UMTS and 2G EDGE/GPRS cellular networks. No. The device has a single SIM card slot. Additionally, if you’re a Project Fi subscriber, you will be able to use eSIM technology. The connectivity options present in the device are Wi-Fi 2.4G + 5GHz 802.11 a/b/g/n/ac 2x2 MIMO(, Wi-Fi hotspot, Bluetooth v5.0 + LE, NFC(Near Field Communications), GPS, GLONASS, Galileo, BeiDou and VoLTE support. Is the device is protected with Corning Gorilla Glass? Yes. The Pixel 2 screen is protected with Corning Gorilla Glass 5 against scratches and has 2.5D curved edges at the corners of the display. The display features a cinematic 5-inch FHD screen which has the resolution of 1920 x 1080 pixels. It is an AMOLED screen with 16:9 aspect ratio at a pixel density of 441 PPI. The Pixel 2 runs on the latest Android v8.0 Oreo pre-installed. Also, the company is giving minimum 3 years of security and OS updates. What are the rear-camera specifications? The rear camera packs a 12.2 MP sensor with a f/1.8 lens that gives optical and electronic image stabilization. Also, it has the capability to record 4K videos at 30fps(frames/second). What are the front-camera specifications? The front camera features an 8 MP lens with a f/2.4 aperture with inbuilt fixed focus mode feature. The front camera has the capability to record 1080p videos at 30fps(frames/second). What processor and chipset it runs on? The device runs on latest Qualcomm Snapdragon 835 SoC that offers smooth user-experience that supports wireless charging. It is powered by Octa-core (4x2.35 GHz Kryo & 4x1.9GHz Kryo) processor and GPU features Adreno 540. Does it have a 3.5mm Audio jack port? No. Pixel 2 doesn’t have an audio jack port but it comes with USB-type C to 3.5mm headphone adapter inside the box. Does it feature a wireless charging? Yes. The device doesn’t support wireless charging tech. What is the device’s battery capacity? Does it feature fast-charging? Yes. The device has the capability of fast-charging and offers 7 hours usage in 15 minutes of charging. It comes with a 2700 mAh battery capacity which is a non-removable Li-ion type. Does it have a fingerprint-sensor? The device does have a fingerprint-sensor for fast-unlocking which is mounted on the back side of the phone. What sensors are available in the device? The sensor of Pixel 2 includes Active Edge, Proximity / Ambient light sensor, Accelerometer / Gyrometer, Magnetometer, Barometer, Hall effect sensor and Android Sensor Hub. Does the phone have heating problem? We can’t comment right now as we need an hands-on experience of the device. Stay tuned for updates. Is the device comes with water or dust proof resistant? Yes. The Pixel 2 is IP67 certified that offers dust and water resistant at a depth of 1 meter for up to 30 minutes. Which material is used in the device? The phone has an aluminum unibody with a hybrid glass coating. At what price Pixel 2 is launched in Dubai? Google launched the Pixel 2 at a price of 649 USD for 64GB variant(around 2399 AED) and 749 USD for a 128GB variant(around 2799 AED) in Dubai. The device dimensions are as follows: 145.7 x 69.7 x 7.8 mm (length * width * height). The device weighs about 143 grams. The “Google Pixel 2” is launched with two memory configurations i.e 64/128 GB inbuilt storage with 4GB LPDDR4x RAM. Google offers unlimited online storage for multimedia up to 3 years. The Pixel 2 comes in 3 amazing colour options i.e Clearly White, Kinda Blue and Just Black.